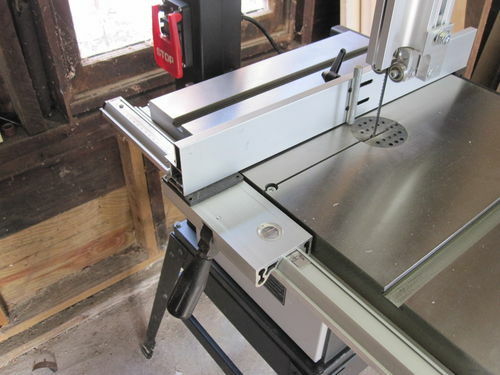 After reading reviews, I went with the Craftsman 14” Bandsaw… driven by price, $340 and convenience of pick up. So, no delivery charge and in Delaware we have no sales tax… so that was the price… $339.99. Set up was easy. The box weighs only 170 pounds… easy enough for neighbor and myself to get down flight of stars to basement. Packaging was great.. no problem. I set up the stand, and then made a small cart with wheels for it. This saw does not come with wheels; no fence and no light. That was understood and fine by me. Manual was bad… black pictures… but not hard to set up otherwise. I needed help to set the saw onto the assembled stand. Not much to set up, most things were preassembled. Minor oil film covering some parts… clean oil, not too messy. Saw was quite when running and no vibration. Blade tracked well. Did not have to fiddle with it… blade was preinstalled… so I turned it on, and it ran fine. Blade (quarter inch, .025 thick, 4 TPI) was bad in that it had difficult time cutting through 2 inch pine. I replaced it with a new Diamond Sterling of same size and TPI. That blade is awesome in comparison. Also, the D-S blade had rounded back edge. The OEM was squared off and sharp… hindering turns. I have purchased a half-inch Wood Slicer resaw blade from Highland Woodworking but I have yet to try it. The saw, table, stand, weigh 160 lbs. Easy enough to move around. The wheels are cast- but not iron, they are some non-ferrus metal… aluminum? The stand is heavy duty stamped steel as was the frame. Seems strong enough. The guides are bearings that are a bit tedious to adjust, but no complaints really. 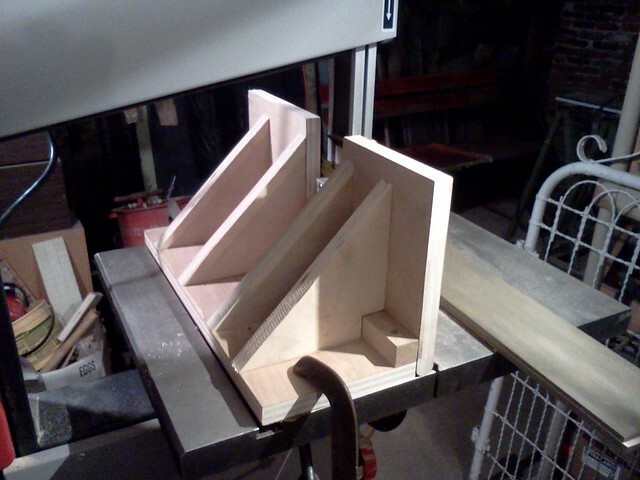 They stayed adjusted when the upper guide was moved up and down for wood thickness. The table is cast iron, and a generous 15.75×20.5 inches. The table insert is heavy plastic… fits tight. The off/on switch has small recessed start, very large stop paddle. Two dust ports seem to work well if I can avoid blowing 15 amp circuit breaker running 2 vacs and the saw. A lttile rewiring of outlets is in order. Upper and lower blade guides are bearings… best to take table off to adjust the lower guide which I think is true for most bandsaws. None of the problems existed as I read about in other reviews across the internet. Original blade was lousy, but 99 3/4 inch length are readily available on the internet. It is a two speed saw. The picture of the wheel shows the two sizes of pulleys to adjust speed. I will probably never need to do that. I am strickly a small shop hobbist… and this saw meets my needs. And one point I should make about reviews in general… be careful of models and model numbers of any tool reviewed. This is a different saw then the 14 inch reviewed by Fine Woodworking a few years back. Rikon has two 14 inch saws, the 10-320 and the 10-325… Also, I think Craftsman has another 14 inch saw to match the Rikon 10-325. So just be cautious that you compare apples to apples. When did you get this? Every time I look for this saw, I find that it is no longer available? I had the same problem with the site… just kept going back to it… and finally it popped up on sale… $100 off list. I ordered it Jan 23 and it arrived Jan 30 ahead of schedule by a good 4 days or so. Also I had problem with web site in that they kept saying none were available… but it was saying that for a store that I had entered by zip code. I couldn’t clear it… almost gave up. But finally, I got it ordered at the sale price and had it delivered to a small Sears store in our area. From there on out everything clicked. So, right now, the Sears Site shows saw is available for zip code 19958 @ $404.99. Zip is for Lewes, DE. Reg $450, sometimes on sale for $405, and then at $340 when I bought it. No coupons used, but you had to order from the web site. Somehow I got email from Sears about a big tool sale…. I think there are too many one’s in that serial number. It might fall apart on the 11th day of the 11th month at 11:11 o’clock. You going to bring it to show and tell? I saw Bill Jefferson’s 18” Rikon today. I got the same saw about 3 weeks ago. I agree with a lot of your review and will be writing a review once I really get to use it. Just a few points – I agree about the manual. The pictures looked like photocopies of photocopies of photocopies. There is also very little written instructions. Everything just says “see picture”. I have assembled many tools at this point so it was pretty easy. if this is the first tool you unbox and are not that mechanically inclined, good luck! The stand is awesome. It was the easiest to assmble stand I have ever put together. No fussing around with it, it just went together. The guides are more than adequate and more than a little bit of a pain in the @ss to adjust. 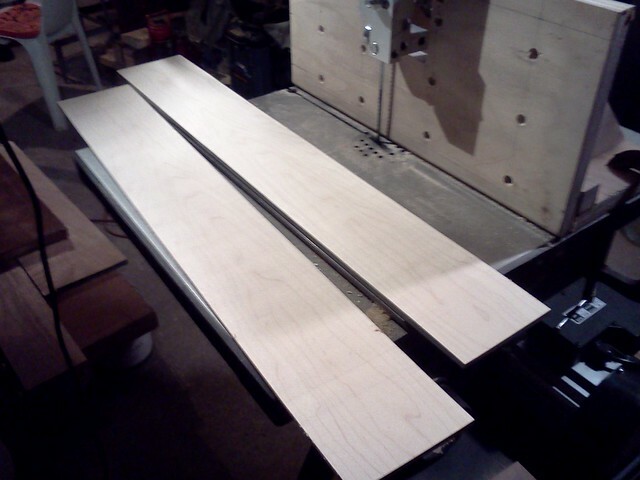 I am new to bandsaws so I have no frame of reference. There will be a set of carter 5 bearing upper and lower guides on the saw soon. Blade changes are easy, tracking is super easy, and it stays true. I got it for slightly less than 340$ out the door thanks to some craftsman club points I didn’t even know I had. I don’t think I could have done any better even with a used saw. 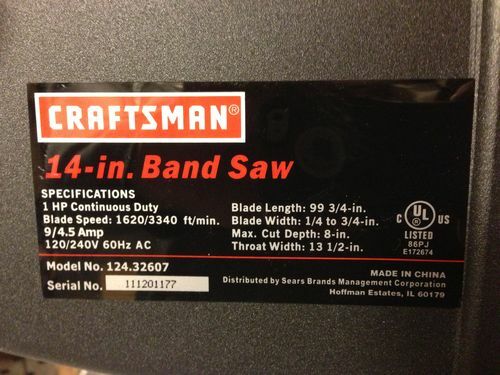 I have a small craftsman 12” that has gotten me started in band sawing. Literally every Craftsman power tool, motorized implement or anything with power from Craftsman over the decades I’ve owned, they all fell apart. They go to a fine company like Rikon, basically copy the unit, then cheapen down the product to make it more competitive. I owned a Craftsman bandsaw years ago, and the critical one piece that broke was the trunion that held the upper wheel and tensioning device. The replacement part was about $30 less than a new saw, so I left Craftsman behind, as I did with a garden tractor, chainsaw, belt sander, router, and variable speed drill. Hand tools, fine, anything with a motor, not so much. I hope you do fine with your tool, it looks great and from the pictures, well made. But I am just not a Craftsman fan anymore, especially once I discovered that behind every counter in the tool section of a Sears store, there is a fair pile of return forms. Why would any store need about 100 return forms under the counter at the register? My first paragraph is why. Ehh. I don’t know. I bought a Craftsman crodless drill several years ago. It was 100% crap. It was also the cheapest cordless drill craftsman sold. Every other craftsman tool I’ve purchased has been, at least, good for the price paid. And many have been great. That said, most of my craftsman tools were made either pre-1985 or post 2007. And I’ve purchased a few in the past couple of years. All work well. My understanding is that the period between the mid 80s and mid 2000s were craftsman’s “darkest” days. 1- Craftsman is a REALLY big tool brand. They sell a gagillion tools every year. Some will eneviably be returned for any number of reasons. 2- It makes sense for the clerk to maintain a large stack of return slips in the place where they are most likely to be used. You wouldn’t expect the clerk to run to the supply cabinet everytime someone returned a tool. If you look at my workshop, there is a lot of Craftsman listed there. I don’t do it on purpose and I actually think a lot of their stuff is junk. However a lot of their stuff is NOT junk. I don’t care what 2.5hp router you wanted to trade me for, I am not giving up that craftsman professional one I have and reviewed here. I’ve used just every brand of router in that class except the Ridgid and would not trade it for any one of them. 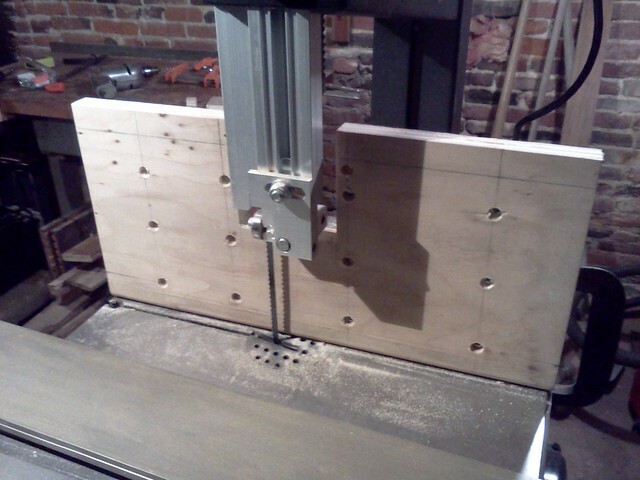 This bandsaw is proving to be a solid performer as well. And my 12.5” craftsman planer? I bought it when it was 7 years old and heavily used (but well maintained). I’ve already put it through hell. It owes me absolutely nothing. In fact, I think I should go give it a hug right now. In anticipation of that, I made a simple fence this morning for it that works really well! I had to try it out on a scrap of course, and even with the crappy blade it worked perfect! Thanks Mike. I have another plan for the fence, and I like yours. By the way, does anyone know the purpose of the bolt that goes in the hole in the front edge of the table top saw kerf? Is it to flatten the table top along the kerf cut out? Or is it some sort of safety device to keep blade inside of table? Clear view of the hole I am referring in this photo—a bolt with wing nut drops through it. It’s to level the table. The table is split so you can get a blade through it (obviously). put a straight edge on it and tighten the wing nut until the gaps are gone. I just bought a used 14” Craftsman Professional 2sp bandsaw. Its got a cast iron table with a miter gauge, and came with 3 new blades. The stand is actually a cabinet, not just a stand. Thing is pretty heavy, it flattened the hand truck tires transporting it to the shop. I’ve never had a bandsaw, but I thought $130 was a pretty good deal. I cracked open the manual and did a basic setup/tuneup on it. The guides seem in fair condition, but I turned them around so the flat is truer to the blade. The upper and lower blade bearings are smooth running. The wheel tires look new. The manual says not to cut metal with it, I’m wondering if this is just something to do with the blade not being the right type. It should cut light metals with the proper blade, I hope. The speed for metal cutting blades is about 200-300 fpm thats feet per minute and for wood it’s 2,000 – 3,000. 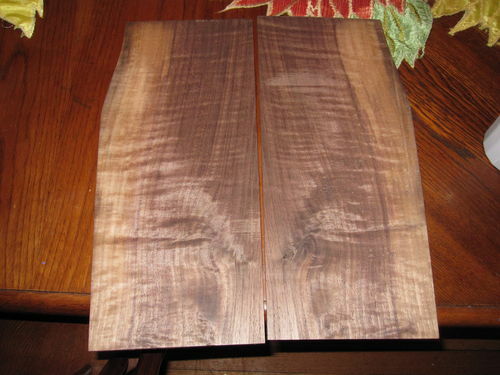 The teeth will be worn off a blade in about 2 seconds if you try to cut metal at wood speeds.